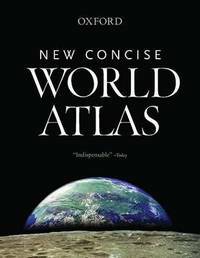 With hundreds of dramatic, full-color, large-format maps produced by Europe's finest team of cartographers, the third edition of the New Concise World Atlas solidifies Oxford's position as the only publisher of regularly updated atlases at every desirable size and price. Containing over 100 pages of the most up-to-date topographic and political maps, the New Concise World Atlas, 3e also features a unique overview of the planet's human and natural processes in photographs, accessible text, and thematic maps. Recent changes to the world's geography are thoroughly captured in this edition, including new national parks in Iceland, Turkey, and South Africa; a groundbreaking rail link joining North and South Korea; and the latest name forms in Somalia. Tribal areas in northwest Pakistan are mapped in greater detail, as are the aboriginal lands of Australia. Fully updated tables and world statistics provide data on climate, population, area, and physical dimensions that cannot be found in any other single reference source. Finally, an index with over 55,000 items make searching for lesser-known locales quick and easy. Truly international in scope, created with meticulous care, and reflecting the very latest political developments and census information, Oxford's New Concise World Atlas, 3e achieves the highest standard among international map resources. This engaging and affordable resource is second to none in the superb quality of its maps, the breadth of its coverage, and its easy-to-use convenience.